The non-drug variety of the cannabis plant has already been legalized in Oregon and California, but it is not commercially grown there yet. Local boutiques and natural food stores sell a wide variety of products made from imported hemp oil, fibers or seeds. Federal drug law forbids the cultivation of the actual plant here due to its close relation to marijuana. Broker and consultant Joy Beckerman Maher of Edmonds, Washington, told state senators that means missed opportunities for farmers. "I receive calls and emails all day from all over the world because folks are under the misimpression that we are mass producing industrial hemp here in Washington because we are cultivating marijuana,” she said. “The reality is they are desperate for it." "This crop has tremendous potential," Beckerman Maher said Tuesday in testimony to the state Senate Agriculture Committee in Olympia. "It's going to be great for our state." Oregon lawmakers approved hemp farming in 2009. But it took until this year for the Oregon Department of Agriculture to work through the logistical and legal details. "We anticipate finalizing the rules by February 2," ODA spokesman Bruce Pokarney said. Then the agency can issue permits to interested growers and handlers. "The intent is to have a crop in the ground this spring,” Pokarney added. "If a marijuana grower growing outside allows their plants to go to seed and flower... that pollen can drift miles and miles in the air, contaminate an industrial hemp growing operation, and then the seeds that that farmer collects for next year's crops could end up containing far more than one percent THC," Eickmeyer warned. Under state laws, the psychoactive component in cannabis, THC, has to be at a level under 0.3 percent for hemp to be legally handled. You cannot get high on it with a concentration around that level. According to the National Conference of State Legislatures, eight states currently have laws authorizing the growing and processing of industrial hemp, including California, Oregon and Montana. California explicitly made its law contingent on federal authorization, which the state attorney general said in a 2014 opinion, has not yet been given except for limited research purposes. Pokarney said the State of Oregon is comfortable issuing industrial hemp licenses to growers because of the latitude the U.S. Justice Department has granted to states with strong cannabis regulations. 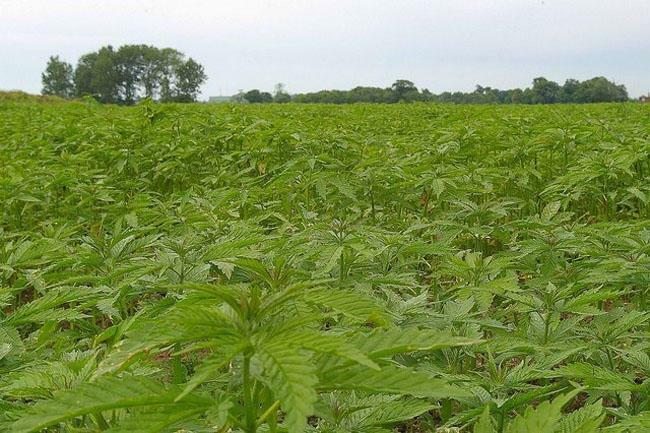 Members of Congress from both parties have co-sponsored federal legislation to approve industrial hemp for cultivation by American farmers, but the legislation has not budged out of committee over many years. In Olympia, the state hemp legislation won bipartisan committee approval in 2013 and 2014, but was not assigned a high enough priority to receive the floor votes needed to advance to the governor's desk. "It just makes common sense to have that (as) a legal crop to grow in Washington state, as Canada and other states have legalized it," state Senator Brian Hatfield said Tuesday as he launched a new version of the bill in the 2015 Washington Legislature. Hemp advocates -- such as the Hemp Industries Association -- like to point out that the fiber had a long history in North America before it got caught up in the War on Drugs. Christopher Columbus and his crew sailed to the New World with sails made of hemp. The Declaration of Independence was written on hemp paper. Presidents George Washington and Thomas Jefferson reportedly grew hemp.